Sorry, the Easiteach Player (and therefore Interactive Music Room) is NOT available for Mac Users. Available for PC only, on Windows 10 or earlier operating systems. A comprehensive classroom music program by Fairbairn-Leehy-O’Mara. Adapted for interactive whiteboard by Cheryl Burgemeister. Written for students in their first year of primary school. Interactive Music Room Book 1 covers the elements of beat, pitch, tempo, dynamics, context and style. It includes 30 lessons, BLMs for assessment, teacher notes, and worked solutions & examples. This resource comes with a teachers manual, data discs and instructional DVD. 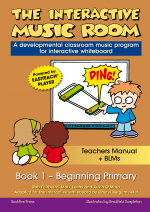 Cheryl has created some instructional videos to guide you through Interactive Music Room. The link below contains a ZIP file that includes all of the components of an interactive lesson for you to try out!